Strong core muscles are essential to us all in terms of daily living and functional movements. The thing is, having a really tight core that you know is strong – looks fantastic too! It’s no wonder, having a six-pack is on everybody’s list of goals. Achieving strong, chiseled muscles on your belly is not an overnight ordeal, but there are certain exercises that will definitely help you build a strong core! Just be sure to eat properly and keep your overall body fat percentage aligned with this goal. I think that we put a lot of pressure on ourselves to, maintain the perfect stomach year-round. 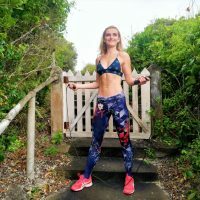 To be honest, it’s unrealistic to have a perfectly defined belly, but you can maintain a strong and toned stomach if you live a healthy lifestyle with regular movement and strength training. Thank you to POPSUGAR, they were able to speak with celebrity trainer Jason Walsh. Jason is a professional at getting his clients into top shape and of course creating rock-solid strong core muscles. He has worked with many celebrities, one of which is Brie Larson who he trained so she could play the role in Captain Marvel. He says that whilst it’s important to concentrate on exercising your entire body and not try to spot-reduce, there are some key exercises that do indeed help create a strong core. Sometimes, when you want a specific body part to look a certain way and it just doesn’t want to happen things can get really frustrating. It’s also confusing when there are plenty of options but you don’t know which ones are right for you. The thing is that you need to really complete your research and establish what will easily fit into your routine and then be consistent with it. Once again, there are thousands of different opinions out there, so at the end of the day, you need to give what works for you all of your attention. If you go onto YouTube right now and type in ‘ab exercises’ you will find thousands of them. Everyone has their own approach to achieving a stronger core. However, Jason tells POPSUGAR that he prefers anti-rotational movements. He says that you don’t have to have a lot of rotation, I think this is an interesting philosophy because many ab exercises involve a whole lot of core rotations and twists. He explains that if you force yourself into a lot [of rotational movements], you’re just going to put a lot of strain on your lower spine. Whereas, getting a strong core using anti-rotational movements is ideal and won’t do any damage to your spine. Ultimately, you’ll end up isolating your core muscles entirely, which makes sense if your goal is to get stronger in the abdominal area. Jason is a huge fan of doing plank variations because they do not require much rotation. He also includes the Russian Twist because it is a slower twist and doesn’t overdo it on the spine. Jason says the exercise also helps strengthen the transverse abdominis. These are amazing exercises that you can easily squeeze into your existing routine, or complete them as a quick workout. Jason recommends performing them for 20 seconds or completing 10 reps per exercise for beginners. However, for those who are more advanced, should aim to perform 30 seconds or complete 14 to 20 reps of each exercise. Rest for 45 to 60 seconds and repeat for a total of two to three rounds. Have a look at POSUGAR’s article to see exactly how each exercise is performed. PCOS frustration (polycystic ovarian syndrome) is common amongst many women worldwide. However, research proves that strength training could be the solution.